Mothers put so much energy towards caring for their little ones, it can feel like your own body is falling apart – like Humpty Dumpty. The Body Gears Humpty Dumpty Program helps you put the pieces of your body back together again by addressing the specific needs of a woman’s body after delivery. It is obvious that the body undergoes significant changes throughout pregnancy and months after. This stress is a miracle, and we are here to help mothers return to an efficient state – stronger muscles, aligned joints, non-restricted organs, and pain-free. We put the whole lengthened system back together again. During delivery, muscles and joints of the pelvis widen and they need help to return to your natural resting position. Even individuals who undergo C-sections need their muscles to properly heal. As if delivery isn’t enough, we appreciate the amount of stress placed on a body post-pregnancy related to bottle feeding, changing diapers, infant soothing, Tummy Time, and managing all other life activities! These added tasks on a healing mother’s body, with joints and muscles, already loosened and overstretched, can lead to negative bodily stresses, dysfunction, and pain. Our therapists can facilitate proper muscular activation and manually address scar adhesions and joint restrictions to allow your body to find and return to its happy state. Let the Body Gears team take care of YOU, so YOU can take care of your newborn! Our Humpty Dumpty program will embrace your transformation. Body Gears’ therapists will incorporate functional movements that teach you how to move appropriately, allowing you to do what you need to do – pick up your child from the floor, hold your infant for hours on end, and even return to your previous exercise routine! 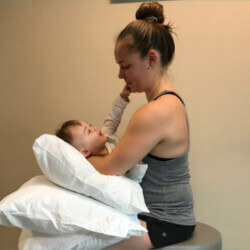 We educate moms in proper posture and positioning for infant care, which includes handling and positioning, lifting techniques, breast and bottle feeding, infant environment engagement, and facilitation of parent-infant interaction. At Body Gears, we also encourage you to bring your baby to your appointments for real-life functional training! Request Free Consult or Contact Us Today at Chicago, Oak Brook, Winnetka & Wheaton, IL Centers.